It was important for me to know the purpose of each of these connectors because I am attempting to streamline my entire wiring harness, and make it "better" than OEM. I also am running a fully standalone engine management system, and it was important that I figure out what some of these connections were for so that I could retain complete stock functionality. Two of the pins are unknown... I searched through the whole of the wiring diagram and I could not find any mention of IG2 pin3 or pin17... I know the white-red wire goes to the check connector, and I believe the same for the white-blue wire... so they arent that important, but ill just make sure to reconnect them back in the same way I found them. CKC means check connector, and some of them I dont know what they mean, but I can tell you where they go and speculate on what their purpose is, really the most confusing seems to be the white-blue series of wires that go to the cruise, coil, CKC, and airbags. 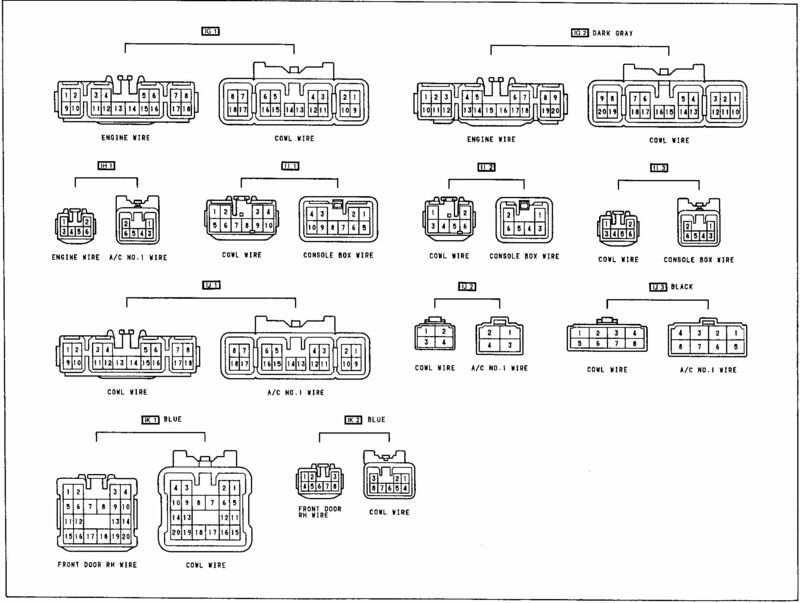 Anyways, here are the pin numbers for the two connectors as described in the BGB (you are looking at the ones labeled IG1 and IG2). Note that the numbers reflect as if you are looking into the open end of the female connector. Below are the descriptions of most every pin. I had to spend quite a bit of time tracking all of these buggers down in the wiring diagrams, but here it is nice and compiled for you. Last edited by l0ch0w on Sun Jan 29, 2012 2:08 am, edited 4 times in total. I have a spare 90 engine harness in the basement. I will go down and check if I can figure out where those wires (what other connector they end up at) go . Hopefully I can remember to take a look. They both are related to the ABS system. When you connect TC with E1 (ground) it will flash the ABS light to tell you which malfunction code was recorded by the ABS ECU, just like checking the engine malfunction codes. When you connect TS with E1 (with TC and E1 still connected) it will give you access to more codes. This all has to be done with the WA/WB jumper removed. So TC and TS, in the diagnosis box are going to the ABS ECU, passing through IG2 connector. I found out that sometimes, the BGBs aren't always right. My Celica's Chilton book isn't accurate at 100%. 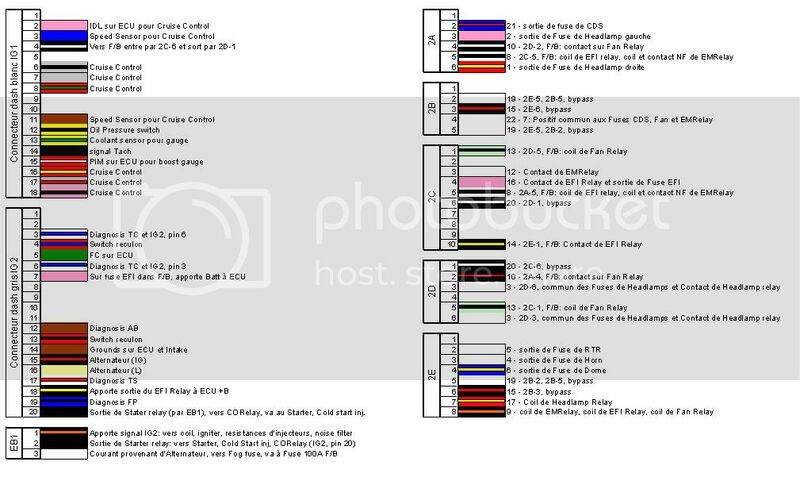 Some pins are mixed up, in the wiring diagrams. I checked about 1000 times over them, misunderstanding and came to the conclusion that the book was wrong, comparing with the real wiring, in the car. ^ I noticed you didnt follow BGB convention for terminal numbering. Ohhhh, maybe! What is different, in the BGB? The way that i wrote it follows the numbering on the connector though. Good! Yeah, gr, can be for both! That is confusing! Why does the A/C amplifier have a Tach signal going to it??? Maybe the AC amplifier needs to know at what rpm the engine is reving. Is there a pin, in the pinout that pointed this out? I believe the a/c amp needs engine rpm signal cause it checks compressor rpm to make sure the pump isn't slipping.